This article was published earlier this week for those who support the site through Patreon. You too can get perks from the site if you support the work here on Patreon. Check it out at the link above (that orange picture right above this text). The Cincinnati Reds drafted right handed pitcher Jose Lopez out of Seton Hall in 2014. He wouldn’t debut with the organization until 2015, as he was recovering from Tommy John surgery that he had while in college. He’s worked his way through each level along the way, starting with Billings. 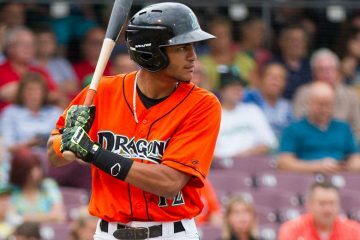 In the 2017 season Jose Lopez began the year in Daytona. With the Tortugas he made nine starts and performed very well. The 23-year-old right hander posted a 2.84 ERA in 50.2 innings with 14 walks and 48 strikeouts. That performance was strong enough to earn him a promotion to Double-A. Jose Lopez was not greeted well in his debut with Pensacola. He was touched up for four runs in 4.2 innings. He allowed two home runs and walked six batters in the game. Things have gone much better since that initial start, though. 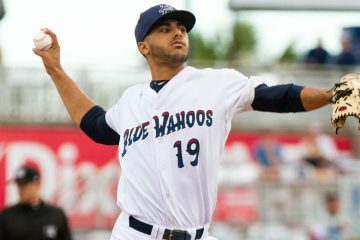 In the 10 starts since that game he’s posted a 2.56 ERA for the Blue Wahoos in 56.1 innings with 19 walks and 56 strikeouts while allowing just six home runs. 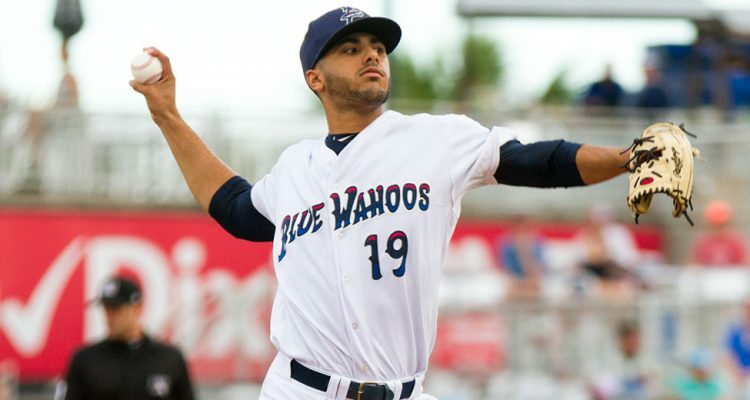 While I was in Pensacola last month Jose Lopez may have had his best start of the year. He allowed one run in 7.0 innings against Chattanooga. That came along with just one walk and he struck out 11 batters. On the night he was showing a quality breaking ball along with controlling the strikezone. The fastball on this particular night was working 91-92 MPH and touching slightly higher. One scout that I spoke with had seen him earlier in the year and had him sitting 91-95. While the velocity doesn’t jump off of the page at you, once scout that was in attendance referred to it as “an invisi-ball”, noting how well he hid the baseball from the hitters throughout his windup. He’s been working on some mechanical things this season. Pitching coach Danny Darwin noted that they’ve been working on slowing him down in his wind up to help give him a bit more consistency in repeating things. They’ve also worked to shorten up things on the back-end as he loads behind his back before coming forward with the ball. Jose Lopez was throwing both a slider and a curveball on the night. The curveball looked better to me with good 12-6 breaking action. His slider was a bit inconsistent, but was a solid-average offering at times. The change up worked in the low 80’s on the night and was also solid offering. He went to the pitch less often than the breaking stuff, which has been similar to times in the past when I’ve seen him pitch on video as well as in person. The upside for Jose Lopez probably isn’t more than as a middle of the rotation starter. There’s nothing wrong with that, and his four pitch mix could play well in the rotation. If he eventually slides into a bullpen role for whatever reason it will be interesting to see how much his stuff can play up in shorter stints. In college he was touching 97 MPH before he had Tommy John surgery, and his breaking ball can certainly be an above-average offering now. For now I would definitely keep him as a starting pitcher. He’s got to be placed on the 40-man roster this winter to be protected from the Rule 5 draft. I would be very surprised if the team didn’t protect him. In the long run, though, at least with the Reds, he may not have a spot in the rotation and could transition to the bullpen. That time is still a ways away, though. Doug, do you think Lopez and/or Reyes will start next season at AAA? If they decide to make room in the AAA roatation for 1 or 2 of these guys, which starters will get moved to the bullpen? Reed and Davis seem like the most likely candidates, but I would like your opinion. Also what bullpen arms from AAA have a chance at starting next season in Cincinnati? I think maybe Lopez could. Doubtful on Reyes, he just doesn’t have the innings at AA. With all of the starters stalling out in triple A (Reed, davis, Garrett, Stephens), I’m not writing Lopez off from starting. I think one of the top priorities for the Reds organization this offseason is making sure they retain Danny Darwin. A lot of Reds minor league pitchers seem to be throwing their best under his tutelage this season. Not to mention as far as nicknames go, Dr Death is up there towards the top. I definitely leave Lopez in a starting role until he proves that he can’t. 4 pitches, solid control, good ground ball rates. He might not ever be a front line starter, but I could see him being a good mid to back end rotation guy who could go out and give you 200 IP of 4 ERA pitching. He’s also been consistently healthy since his TJS in college with 148 IP last year and on pace for about that much or possibly a little more this year. If he makes it, he’ll be about ready to go a full season as soon as next year maybe if they stretch him out a little further in fall instructionals to push that 148 IP from last year to around 170 IP this year. 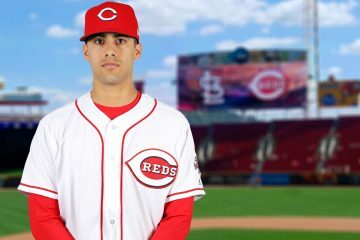 Going into next year, if I’m the Reds, Rookie Davis gets moved to the bullpen as a one inning max effort pitcher where he the fastball can play up and he can focus on one secondary offering. I could see him sitting 94-96 and touching 97-98 in that kind of role. Garrett has to stick on the MLB team next year, so if he doesn’t win a starting spot, that’s probably about it for him and they’ll move him to the bullpen as well. Reed has another option, so I definitely leave him as a starter for now, especially if we transition Garrett to a bullpen role. Cody Reed has two options remaining after this year. In 2016, he was added to the 40-man roster in June. He was optioned on August 15 and recalled on September 2. Since he didn’t remain in the minors for 20 days, he was credited with Major League service time for those days and the Reds ability to option him was retained. Bottom-line: Reed doesn’t have to stick on the major league roster until 2020. There’s plenty of time to work out his mechanics and develop Reed as a starter. Great write up Doug. Danny Darwin sounds like he needs to be the mlb pitching coach. Also sounds like the same problem that Stephenson has. They need to slow him down in order to repeat the same delivery. Darwin might be on to something. Is he the only one catching these things? I say replace Jenkins with Darwin. He has a vast wealth of knowledge pitching in the mlb along side of Nolan Ryan, Jim deshaies, mike Scott and others. Great eye Mr. Darwin. Imagine what he can do to for everyone else. I think the Reds are having thoughts of Lorenzen as a SP because, in part they realize they have so many on the farm that can move to the pen and very few who can start. Rookie Davis belongs in the pen. Jackson in the pen. Sal Romano is nothing more than a bullpen arm. Finnigan, Reed, Stephenson, Lorenzen and Garrett have a chance to make it as SP anyway. Seems to me that Bailey, Disco (if he can get healthy) Castillo and Mahle will be in the rotation next July. The 5 spot is anyone’s guess. I personally feel Reed is the favorite here. It would be nice if Stephenson suddenly found it the next couple of months and the Reds start 2018 with a rotation of Bailey, Disco, Castillo, Stephenson and Reed with Peralta, Hernandez, Garrett, Romano, Finnigan, Lorenzen and Iglesias forming the core of a strong pen. Mahle in AAA to replace Disco/Bailey when one hits the DL or move Garrett to the rotation. As I recall Lorenzen did not exactly flourish as a starter which is a reason he was in the pen. Lopez was one of those guys who you really do not realize he is pitching that well until you go back and look at his stats later, them you think he is pretty darn good. A funny thing is that Lopez’s batting average against has fallen significantly since his promotion. High A hitters hit .262 against him and he gave up just about a hit per inning, whereas AA hitters are hitting .192 against him and he has only given up 45 hits in 62 IP in AA. His K rates are about the same over both levels, his walk rate has increased, and he’s given up significantly more home runs in AA. If his HR given up rate had stayed the same, he’d probably have a sub 2 ERA right now in AA.